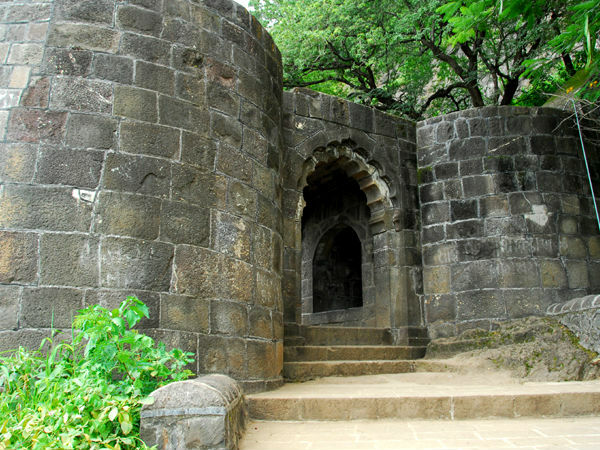 Shivneri Fort is a hill fort located at the northern side of Pune, with Junnar as its base. It is the birthplace of Chhatrapati Shivaji, the founder of the Maratha Empire. The fort was built by Shahaji Raje, Shivaji's father, to secure his son and wife Jijamata, against the invaders and natural calamities. The fort is a delight for trekkers, it can be reached by two routes, one is a properly laid out road which takes you up the hill in the southern direction. The next path is most preferred by trekkers, which is climbing up the hill using the stair way comprising of about 400 steps, after which one has to ascend the steps of Rajmarg and pass through the seven magnificent gates. Mid-way there are rock-cut caves, some of which are difficult to access. Further ascent is in the form of narrow cut steps, many of which are in a disintegrated state, and as far as the time taken to reach the summit, it is about an hour both ways. The shape of the fort is like an arrow which points North. The fort has succumbed to ravages brought on by time and weather. August to February is the best time to visit the fort. The lush greenery and the pleasant environment adds on to your experience. Shivneri fort is located at a distance of about 95 kms from Pune and 155 kms from Mumbai. The first ruins that you would come across are the Ambarkhana or Dhanyakothi. This was a granary where the food grains were stocked for years together. Next is a twin underground water tank, called Ganga -Jamuna cisterns. Experts say these tanks belonged to the Satavahana period, around 2000 years ago. The spot where Chhatrapati Shivaji was born was reconstructed in 1925, it is known as Shiv Mandir. In this vicinity there is a huge circular water tank called Badami Talav, however, it does not hold water any longer. Towards the north side is a precipitous cliff that is known as the Kadelot Point. It is believed that criminals who were awarded capital punishment were handcuffed and thrown down from here. There are seven fortified gates that need to be passed to enter the fort namely Maha Darwaza, Ganesh Darwaza, Pir Darwaza, Hatti Darwaza, Shivai Darwaza, Mena Darwaza and Kulup Darwaza. One can notice a temple dedicated to the Goddess Shivai Devi. It is said that Shivaji was named after the Goddess. The Government has erected a temple in honour of Shivaji, which is known as Shiv Mandir. It houses the idols of Shivaji and his mother Jijamata. The fort also has Buddhist caves dating back to the 3rd century and a mosque built in the Mughal style of architecture. The options of food and accommodation are very less near the fort, it is best to stay at Pune, which has a lot to offer you.